There was a time when I played golf frequently, and I cared about my game. Birding changed all that. Now I hardly play at all, and when I do I’m more interested in what birds I might see than in shooting a good score. Golf courses can be so “birdy” that I’d be better off leaving my clubs at home. In fact, that’s what I did on May 14 when I reported to the The Village Links of Glen Ellyn for the 2005 North American Birdwatching Open. 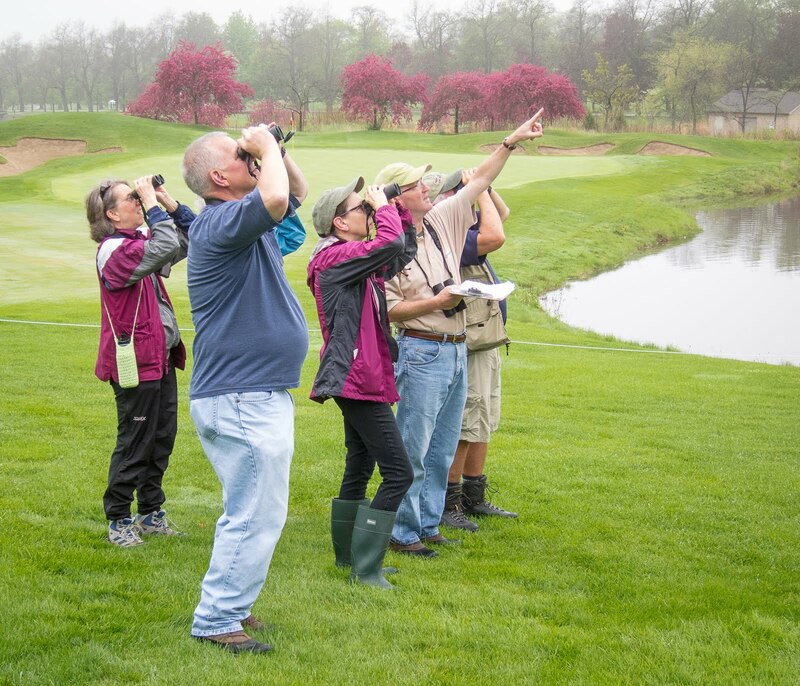 Sponsored by Audubon International, the event takes place every spring on certified habitat-friendly golf courses all over the country. Birders keep score by counting how many species they see or hear. Our host for the day was Chris Pekarek, Village Links assistant superintendent and a 32-year employee of the golf course. Before setting out he explained how Village Links strives to be a good home for birds and other wildlife. When the 225-acre course opened in 1967, Pekarek says, “we mowed from fence to fence.” In other words, it was maintained like most of the 17,000 other golf courses in America. But things began to change in the 1980s when The Links embarked on a long-term project designed to make the course more natural. Hundreds of native trees were planted along with native prairie areas. A key turning point came in 1991 when Audubon launched a program with the United States Golf Association. Golf courses, for the first time, were encouraged to help wildlife by limiting pesticides, improving water quality and planting protective cover. In 1993, Village Links became the first public course in the nation to be designated an Audubon Cooperative Sanctuary. “The program’s been very positive for us,” Pekarek says, “and it was easy to get results.” He recalls putting up 10 nest boxes in 1991 and watching bluebirds move in two years later. Eastern bluebirds remain a fixture at Village Links, although the population is up and down from year to year. There are dozens of bluebird boxes on the golf course but many are occupied by tree swallows. Active chickadee and wood duck houses are on the grounds, too. We only saw one pair of bluebirds during the Birdwatching Open, but there was no shortage of birds overall. Pekarek took us to his favorite spots, including some obscure patches of woodland that most paying customers never notice. In one such area we found a black-throated blue warbler, one of 13 warbler species on the day. Along the way, Pekarek showed us a killdeer nest, something I’d never seen before. It wasn’t much of a nest, just four well-camouflaged eggs lying on bare ground. The mother killdeer performed her broken-wing act in trying to divert our attention. We got the message and didn’t linger. Not far from the killdeers we observed a red-tail hawk nest where a parent was feeding at least two youngsters. Our final “score” was 58 species. Of course, the main point was to bring some attention to the important role that Village Links and other golf courses can play in providing bird habitat. The Links, in turn, sponsors the Glen Ellyn Backyard Wildlife Program for habitat-minded homeowners. To request information, send an e-mail to GEVLCP@aol.com. Reiter is a Glen Ellyn, Illinois, resident who enjoys birding at home and in the field. You can reach him at jreiter@wordsonbirds.com.